But what about fathers? What are their experiences during those wondrous nine months? How does the attachment process begin for them? Is a father’s only option to look on with wonder (and sometimes envy) at the beautiful relationship forming between his once-doting partner and this tiny interloper? Is it the extent of his calling to act as back-rubber, chauffeur and coach? Do these “staff support” roles reflect the monumental potential influence fathers have in their family’s life? Fathers actually have a natural, even biological, inclination to begin attaching to their babies during pregnancy, but this is largely ignored by the scientific community and by our collective culture. We bemoan absent fathers, but do we really nurture the seeds of their involvement from the very beginning, when it may lay a critical foundation for later attachment? When a couple announces that they are having a baby, the role of the mother is tightly defined. Her family, friends, co-workers and even strangers treat her in an unambiguous fashion: she is doted on, showered with attention (sometimes to their dismay), and regarded in a way that emphasizes her mother-to-be status. Her partner, on the other hand, has no designated, well-choreographed role to play. He is usually left to stumble along his path to fatherhood with little direction, or acknowledgment of his own internal processes. Our language and our culture clearly support the notion that it is never he, only his mate, who is expecting a baby. He is often treated as a donor, a bystander and — if he is any good at his multiple but vaguely-defined jobs — it is understood that he will be supportive of the one who is truly important, the only one who is doing any work, the truly pregnant one. Pregnancy, birth and parenting awaken for all of us, mothers and fathers alike, old feelings and sense-memories of our own womb and babyhood experiences, which further make parenthood a journey of unprecedented proportions. 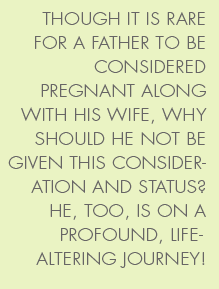 Though it is rare for a father to be considered pregnant along with his wife, why should he not be given this consideration and status? He, too, is on a profound, life-altering journey! When Trina was pregnant, her husband Doug often spoke in terms of “us” and “we” with regard to the pregnancy, his language clearly reflecting his emotional and psychological participation in that monumental life event. One of his female colleagues was annoyed by this and would indignantly declare, “You, Doug, are not pregnant! When you get fat and have stretch marks and an aching back every night, come and talk to me!” This response is archetypal in our culture, a staple sitcom punch-line that unfortunately reflects the prevailing attitude. Devon, a 29-year old computer technician, said that during his wife’s pregnancy he felt as if he had become invisible to everyone, including her (from whom he later separated). I wanted a baby so bad! But after the initial excitement wore off, it was like, what do I do now? Michelle was totally into the baby and how her body was changing and how I didn’t get it. Everyone else acted like that too, like I could never understand since I wasn’t the one who was pregnant. But I felt like I was. I know it sounds really corny but I really did. It made me feel crappy that no one cared how I felt. Mothers-to-be can be encouraging and sensitive to these delicate first steps of fatherhood, putting forth every effort to making their baby accessible. Brett, father of eight-month-old Elissa, described the weeks when Elissa’s movements were first noticeable under his touch, and the emotional tidal wave that washed through him, carrying with it the reality of his unborn child. He reminisced about times when he could scarcely attend to his work during the day because he was so anxious to get home and feel his baby moving beneath his fingertips. I liked to just lay with my head resting on Jae’s belly so I could breathe on her skin. I thought that maybe somehow Elissa could become accustomed to the feel of my breath surrounding her and she’d know how much I couldn’t wait to see her, and maybe she’d know me when she was finally born. Fathers can be full participants during pregnancy, parents who are deeply affected by the experience of conceiving and loving a child and who process the experience in their own profoundly personal ways. We don’t need to designate a new “role” for fathers regarding this process; a role already exists, naturally — not as replicas of women or as assistants to carry the suitcase, but as the biologically inspired caregiving partners they are designed by nature to be, and as men who long to be enthralled with the very presence of their unborn babies. One important way research shows an expectant father can contribute to his baby’s optimal development during pregnancy and beyond is to reflect on his own childhood and how he himself was parented. And during pregnancy one way he can help foster his baby’s most vibrant development in the womb is to love, celebrate and cherish his baby’s mother…to dream of the great and noble qualities he dreams of for his coming child…and to hold a positive outlook on daily living. Just as a mother’s perception of life powerfully influences their baby’s prenatal development, a father’s perception of life deeply influences his baby’s mother, which strongly influences her perceptions of life! A pregnant mother particularly relishes strength, creativity and a sense of optimism in her partner at this momentous time. This entry was posted on Thursday, June 14th, 2012 at 4:30 am	and is filed under Parenting for Peace. You can follow any responses to this entry through the RSS 2.0 feed. You can leave a response, or trackback from your own site. Thanks to your reminder, VIcki, I’ve hyperlinked another article that speaks to both these fascinating facts — thanks!! Great work Marcy! I am sharing this now with my contacts and my expecting parents. Thank you, Barbara, for helping this information fly far!